1 King, 2 Queens (upstairs), 2 Queens (downstairs) = 5 HUGE Beds! 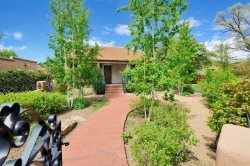 Walking distance to the historic Plaza and Canyon Road, this classic pueblo-style residence is completely new (2010) construction featuring modern amenities and appliances. Casa Sanchez is mere blocks from Santa Fe's top restaurants, museums, galleries and historic sights. This historic Eastside jewel was a 2010 home tour award winner (best kitchen, best use of natural light, green award). Features include a chef's kitchen, French doors opening to spacious and inviting rear patio, hardwood floors, high-ceilinged open living and dining areas, exposed antique ceiling beams and authentic antique doors. Newly upgraded in 2013 with state- of-the-art Sonos sound system and smart TV, all new furniture, linens and towels, air conditioning, and a Weber patio gas grill. Four bedrooms, four-and-a-half baths; 2,750 square feet. One king bed (master BR), four queen beds, three enclosed outdoor patio areas. Guest quarters with full bath served by separate entrance. Adobe wall surrounding property assures your privacy. Luxurious master-bath featuring soaking spa-tub and sky-lighted shower. Owner’s private art collection beautifully exhibited through-out home. Skylights and clerestory windows bring the enchanting New Mexican sky to the indoors. Three interior wood burning kiva fireplaces, one kiva wood burning fire place on rear patio. Spacious, well-designed closets and pantry. Off-street parking for three cars. Perfect for a secluded get-away but large enough for full family gatherings or for sharing by three to four couples. Approximately, 2,750 net square feet. Air Conditioning in living area and upstairs bedrooms. Ductless A/C Units. All members were knowledgeable and friendly. Rental was clean, accommodating, roomy, close to town, and quiet.. Wonderful experience. Look forward to coming again - maybe in the summer. Once again Casas de Santa Fe and Casa Sanchez provided a wonderful background for a family gathering. The home is beautifully decorated and comfortable, for a group our size ( 7 people,) it is the best location in Santa Fe, close to the Plaza and Canyon Road and within walking distance of almost all of Santa Fe. The home is well-supplied, the staff accommodating as always. We look forward to another October gathering at Casa Sanchez. Casas is by far the best vacation rental company in Santa Fe. CdSF was easy to work with and the extra day they gave us on the front side of the rental allowed my wife and I to really enjoy our sons families when they arrived a day later. We simply could not have asked for a more positive experience. The staff at Casas de Santa Fe were responsive, helpful and efficient and the Casa Sanchez is an exquisitely designed and furnished house -,both staff and residence are responsive to the guest's needs and fully accommodating. The house was amazing and exceeded our expectations. Overall, a wonderful experience. Thank you! You guys are our go-to in Santa Fe!